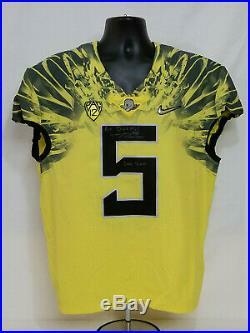 Oregon Ducks Team-Issued 2017 Nike Game Worn Football Jersey. Signed on the number 5 on the front of jersey. 100% Guaranteed Original and Authentic. Men’s 46 Pit to Pit: 23 1/2 inches Length: 29 1/2 inches Please see pictures or feel free to contact me with any questions. 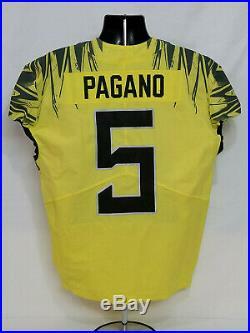 The item “2017 Oregon DUCKS Team Issued NIKE Game Worn FOOTBALL JERSEY #5 Pagano MEN’S 46″ is in sale since Wednesday, March 27, 2019. 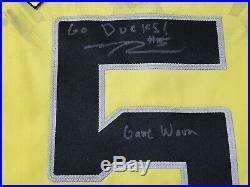 This item is in the category “Sports Mem, Cards & Fan Shop\Game Used Memorabilia\College-NCAA”. 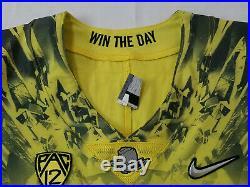 The seller is “webleedgreenandyellow” and is located in Eugene, Oregon. This item can be shipped to United States, Canada, United Kingdom, Denmark, Romania, Slovakia, Bulgaria, Czech republic, Finland, Hungary, Latvia, Lithuania, Malta, Estonia, Australia, Greece, Portugal, Cyprus, Slovenia, Japan, China, Sweden, South Korea, Indonesia, Taiwan, South africa, Thailand, Belgium, France, Hong Kong, Ireland, Netherlands, Poland, Spain, Italy, Germany, Austria, Bahamas, Israel, Mexico, New Zealand, Philippines, Singapore, Switzerland, Norway, Saudi arabia, Ukraine, United arab emirates, Qatar, Kuwait, Bahrain, Croatia, Malaysia, Brazil, Chile, Colombia, Costa rica, Panama, Trinidad and tobago, Guatemala, Honduras, Jamaica, Antigua and barbuda, Aruba, Belize, Dominica, Grenada, Saint kitts and nevis, Saint lucia, Montserrat, Turks and caicos islands, Barbados, Bangladesh, Bermuda, Brunei darussalam, Bolivia, Ecuador, Egypt, French guiana, Guernsey, Gibraltar, Guadeloupe, Iceland, Jersey, Jordan, Cambodia, Cayman islands, Liechtenstein, Sri lanka, Luxembourg, Monaco, Macao, Martinique, Maldives, Nicaragua, Oman, Peru, Pakistan, Paraguay, Reunion, Viet nam, Uruguay.